Applecross has unspoilt, clean, uncrowded beaches rivalling any in the British Isles. 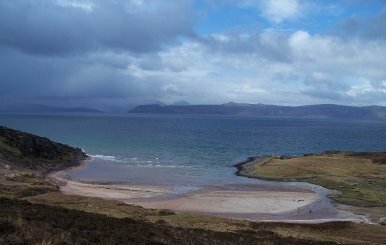 These include Applecross Bay itself, one of the largest sandy inlets in the Western Highlands, the picturesque Sand beach made famous by Monty Hall, the coral beaches of Ardban and Coillegillie, and the infrequently visited Cuaig beach towards the north of the peninsula. All have unsurpassed views to Raasay and the Cuillins of Skye. Details on how to find these beaches can be found under the WALKS tab above, with further information on the natural history of coral beaches provided under Natural heritage and wildlife.